By visiting this website of Coolmusic GmbH non-personal information (date, time, visited site) may be collected. This data does not permit direct association with any specific individual. Coolmusic GmbH may collect and use this information for statistic purpose only. This website includes product-related videos of the YouTube page operated by Google. YouTube is operated by YouTube, LLC, 901 Cherry Ave, San Bruno, CA 94066, USA. When you play a video, a connection is made to YouTube’s servers and the YouTube server is told which pages you have visited. If you are logged in to your YouTube account, you allow YouTube to match your surfing behavior with your personal profile. If you do not want this, you must log out of your YouTube account. By clicking on a link (on “YouTube” or “Share”) within the video frame you get to YouTube. YouTube’s terms and conditions and data processing guidelines apply there. The use of contact information in the imprint for commercial advertising is expressly undesired. The provider and all other persons named on this website hereby refuse to permit any commercial use or further dissemination of their data. The material and information contained on this website are for general information purposes only. Coolmusic GmbH will not be liable for any false, inaccurate, inappropriate or incomplete information presented on the website. Use of this website does not mean in any way that a contractual relationship has been established between the user and Coolmusic GmbH. 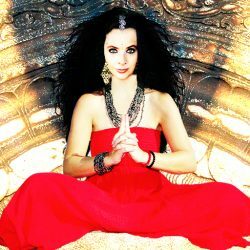 Some hyperlinks on this website link to contents which are not operated by Coolmusic GmbH but provided by third parties. 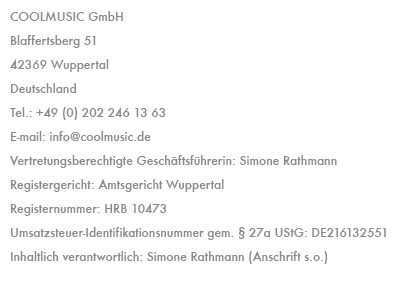 Please note that Coolmusic GmbH is not responsible for contents offered by other organisations. Content, design and concept are intellectual property of Coolmusic GmbH and protected by international copyright law. No parts of this website and no photos or other material may be copied, printed and used without permission of Coolmusic GmbH. Any further rights not specifically granted herein are reserved. Presenting this website in other Frames is not allowed. Canda and Coolmusic are registered trademarks (®) at the Deutsches Patent- und Markenamt in Munich by Coolmusic GmbH. Any third-party trademarks, service marks and logos are the property of their respective owners. Trademark infringement can cause fines and legal consequences. Coolmusic GmbH expressly draws attention to the fact that data transfer in the Internet, e.g. communicating via email or filling out online forms, generally has security loopholes and cannot be entirely protected against access by third parties.